The Poultry Segment provides a comprehensive portfolio of products, which have been developed ensure consistent performance and improved flock health. Customers who use our poultry products are well aware of our commitment to ensuring optimal respiratory and intestinal health for efficient and uniform growth. We aim to deliver value throughout the food chain from farm to fork, helping poultry producers achieve flock uniformity and improve production efficiency. In essence, our efforts have an extensive positive impact in the communities in which we operate. A broad spectrum antibiotic that effective against Gram-positive bacteria (Staphylococcus, Streptococcus, Clostridium, Actinobacillus and Corynebacterium etc. ), Gram-negative bacteria (E-Coli, Salmonella, Pasteurella and Haemophilus etc. ),Mycoplasma Gallisepticum and Mycoplasma SynoviaeDoxitylprovides protection against enteric and respiratory diseases. Lincamox-S is a combination of broad-spectrum antibiotic with a bacteriocidal action against both Gram-positive and Gram-negative bacteria. The range of effect includes Campylobacter, Clostridium, Corynebacterium, E,coli, Erysipelothrix, Haemophilus, Pasteurella, Salmonella, Staphylococcus, and Streptococcus spp. Synergistic effect of these antibiotics provides protection against infections caused by Mycoplasma Gallisepticum and Mycoplasma Synoviae. Vitamin E being an antioxidant helps to improve immune status of birds during tress periods. A combination of very effectivebacteriocidal antibiotics to provide protection against organisms sensitive to Colistin, Neomycin and Chlortetracycline causing Colibacillosis, Fowl Typhoid, Infectious Coryza, Fowl Cholera and Bacterial Enteritis. Pulmotil® AC by Elanco Animal Health, containing new highly effective liquid macrolide Tilmicosin, controlling respiratory diseases. Tilmicosin, is a semi- synthetic macrolide antibiotic approved for use in Chicken. In order to explore the application of PAC for treating poultry forairsacculitis. Tilmicosin is distributed in the chicken lungs and air sacs in a concentration (2.30 +/-0.72 µg/g lung after 48 hours of oral treatment) that exceeds the minimum inhibitory concentration (MIC) for MG (0.0125 µg/ml) and MS (0.1ug/ml). Once the bacteria are engulfed, Pulmotil® AC contacts the bacteria and kills them. The macrolides are a group of drugs (typically antibiotics) whose activity stems from the presence of a macrolide ring.Macrocyclic lactone ring to which one or more deoxy sugars, usually cladinose and desosamine, may be attached, the lactone rings are usually 14-15 or 16-membered. Macrolides belong to the polyketide class of natural products.Like other macrolides, tilmycosin has a bacteriostatic effect on susceptible organisms, caused by inhibition of protein synthesis through binding to the 50S subunit of the bacterial ribosome. For the treatment and control of respiratory infections in chicken flocks, associated withMycoplasma gallisepticum, Mycoplasma synoviae,Ornithobacteriumrhinotracheale,PasteurellaMultocida, Organisms sensitive to tilmicosin. Time tested broad spectrum antibacterial for the treatment of bacterial disease in poultry specially coli-septricemia, infectious coryza, Fowl Typhoid, Fowl Cholera and staphylococcal arthritis. It is rapidly absorbed and widely distributed. It has unique mode of action. Due to these double sequential blockade chances of resistance very low. It does not affect egg production and growth. It has micronized particle so easily dispersible and uniform mixing. Its melting point is 128–132 °C (85°C usually in pallet feed). Itsuppresses Mycoplasma Infections, so it is a key part of a good anti-mycoplasma program. Tylan specially formulated to give excellent stability, easy to mix, non-carry over, granular premix. It is starch coated and granulated which allows it to be stable for 2 years. Tylan® Premix Granulated improves mixability, homogeneous distribution in the feed and reduces possible de-mixing during feed transportation. It improves digestion of protein, so it improves the nutritional status of laying bird. Increases egg output by 15 eggs per bird. Reduces feed costs by 120 grams per 12 eggs. Egg size, grading, shell quality will improve. Tylan stimulates the immune systems, so the birds are healthier and resist disease, no egg residues.The carrier of Tylan® Premix Granulated is soybean mill run, which has a protein content of 14 percent and hence adds to the quality of finished feed. Eggs from layers on Tylan® Premix Granulated do not contain tylosin residues. Also layers tissues are free from residues 24 hours after the last oral administration. Store in a cool and dry place, protect from moisture and heat. Product should not beused after the date printed on the container. Tylan® premix for prevention 100-500 ppm for 5-7days repeats after 25 days for one week. Tylan®Premix for treatment 800-1100 ppm for 5-7 days. Remove all medication, sanitizers and disinfectants from the drinking water, preferably 72 hours before vaccinating and 24 hours following vaccination. Provide enough watering space so that at least two-thirds of the birds can drink at one time. Withhold water for 2 hours before vaccinating to stimulate thirst. Open the vial inside the cool water below from room temperature. Pour whole contents of the vial in the water. Then mix this stock solution in the total drinking water at a sufficient volume to last 1.5 to 2 hours at current flock water consumption rates. Provide no other drinking water until all the vaccine treated water has been consumed. Bum empty bottles, caps and all unused vaccine and accessories. Vaccinate only healthy birds. Although diseases may not be evident, coccidiosis, chronic respiratory disease, mycoplasma infection, lymphoid leucosis, infectious bursal disease, Marek’s disease, or other disease conditions may cause serious complications or reduce protection. Vaccinated birds should not be placed on contaminated premises. Exposure should be avoided immediately after vaccination, because it takes up to 10 days to develop resistance. The vaccine should be diluted with 280 ml of distilled water per 1000 doses of vaccine. Each 100 birds should receive 28 ml of vaccine solution (Dye may be added as a marker). The vaccine should be diluted with 400 ml of distilled water per 1000 doses of vaccine. Each 100 birds should receive 40 ml of vaccine solution. (Dye may be added as a marker). Manually spray the 40ml vaccine water on one box of 100 chicks. Do not use any medicated drinking water or water disinfectant 24 hours before and after vaccination or during vaccination. Feed sprinkled on paper under the feed line increases the exposure of chicks to the vaccine. Dilute the vaccine at a ratio of 1000 doses/400 ml of non-chlorinated water. Mix well and use clean garden type pressure sprayer. Spray the diluted vaccine over the surface of the feed. Agitate the sprayer during administration. For best results, the vaccine should be sprayed on all of the feed. Avoid wetting the feed. Proper application will only dampen the surface of the feed. Allow the chicks’ sufficient time to ingest the oocysts on the feed before placing more feed in the pans or on the paper. For best results vaccine recommendation is only for Eye Drops administration. For revaccinate healthy breeders, layers and broiler for the prevention of Newcastle disease. Newcastle N63® is a vaccine replicated in SPF chicken embryos; made with LaSota strain N63 responsible for Newcastle disease paramyxovirus. Open the vial inside the water below from room temperature. Pour whole contents of the vial in the water. Then mix this stock solution in the drinking water and ensure the water will consume in 20-30 minutes. Create half hour thrust to ensure the quick consumption of the vaccine water. For its transmission capacity from bird to bird, it is very effective in massive vaccine applications (via drinking water and spray). For vaccinate healthy breeders, layers and broiler for the prevention of Newcastle disease. Newcastle N79 is live virus, Chicken Embryo Origin. Provide no other drinking water until all the vaccinetreated water has been consumed. Newcastle Cloned N-79 is a live virus vaccine of chicken embryo origin containing a clone selected B1 Type, LaSota strain Newcastle disease virus. This virus has the ability to stimulate protection against a wide variety of Newcastle field strains while causing a milder reaction, in healthy chickens and turkeys, than other LaSota strain vaccines. Clone-selected LaSota strain stimulates strong immunity against Newcastle disease, while producing only mild reactions. Vaccinate only healthy birds. Although diseases may not be evident, coccidiosis, chronic respiratory disease, mycoplasma infection, lymphoid leukosis, infectious bursa! disease, Marek’s disease, or other disease conditions may cause serious complications or reduce protection. For control of infectious bursal disease in poultry, use vaccine indrinking water at 1 week or older as an aid against IBD as primary vaccine. Thoroughly mix 500g to 625gMaxibanTM in one metric ton to provide a level of 40 to 50 g each of narasin and nicarbazin activity per metric ton of complete feed. MaxibanTMmust be thoroughly mixed with at least 5 times its own weight (minimum 20 kg) of a suitable feed ingredient before incorporation into the bulk of the finished feed. Feed as the only rationin the first part of shuttle-programs or continuously as the only ration up to withdrawal before slaughter. The preparation of narasin and nicarbazin shall not be mixed with other coccidiostats. Do not allow horses or other equines access to feeds containing narasin. Ingestion of narasin by horses has been fatal. Do not use in other poultry than broilers and other avian species. Do not feed to chickens producing eggs for human consumption. Use prohibited at least 5 days before slaughter. Poultry consuming narasin should not be treated with products containing Tiamulin. Severe growth depression or fatality may occur. Avilamycin is produced by the fermentation of Streptomyces viridochromogenes. The antibiotic is present as an insoluble solid in the fermenter medium. It is then separated and dried to form the active ingredient of the premix. The dried fermenter solids also contain inactivated Streptomyces viridochromogenes and unused nutrients from the fermentation process. Avilamycin has never been used in human medicine, nor is it chemically related to any class of compounds used in human medicine. Avilamycin is an oligosaccharide antibiotic of the orthosomycin group. Avilamycin premix is a free flowing, granular material with uniform particle size for homogenous distribution in feeds. Maxus remains stable during the pelleting operation, including steam conditioning of the feed and in pelleted feed for at least three months at 25°C (77°F). Studies have demonstrated that Maxus™100 premix is stable at 25°C (77°F) for at least 24 months. When Maxus™ is mixed with feed, avilamycin is stable in meal feed for at least three months at 25°C (77°F). Use for prevention and control of Necrotic Enteritis caused by Clostridium perfringens. Retention of Nitrogen, the building blocks of amino acids and protein is improved in the birds on Maxus™ this means that birds on Maxus™ retain more nitrogen from consumed feed and built it into meat. Weighed 90 grams more than the control group Showed 9 point’s improvement in FCR. Had 77g more carcass weight and 1% improved. Co-Spira is a broad spectrum antibiotic highly eﬀective against E. Coli, Typhoid, Mycoplasmosis, CRD, Kidney Inﬂammation, Arthritis and respiratory diseases. 1ml per 2liters of drinking water for 3-5 days. 1ml per 4liters of drinking water for 3-5 days. Store below 25C in a cool and dry place. Store away from reach of children. Available in 500gram and 1kg packing. Takeda, Japan developed Enramycin in 1966. In 1974, Takeda Enramycin premix was registered in Japan. Afterwards, Enramycin premix has been registered and marketed many countries. MSD Animal Health became the owner of Enramycin seed culture and technology and in 2005. Enradin belongs to the family of Cyclodepsipeptide antibiotics. It is fermentation derived molecule, produced by Streptomyces fungicidicus and it formed by 17 aminoacids, from 13 different types. It has two fractions (A and B), both are active. Cyclodepsipeptide Antibiotics- including Enradinact inhibiting the Gram (+) bacteria cell wall synthesis. Enradin prevents cell wall glycan chains formation, binding and blocking Lipid II, a peptidoglycan precursor. Enradin® is antibiotic growth promoter. Enradin® has been proven to be the most effective Clostridium spp control product. Made from the original Takeda master seed strain, it has kept a constant MIC after 40+ years of continued commercial industry use. Recognized efficacy makes Enradin® the best alternative to be used during the high challenge seasons of the year. Nutritionists all over the world trust Enradin® to establish healthier micro flora and better intestinal integrity. It is an extremely safe feed medication, not only because the large molecule size prevents its absorption to avoid tissue residues, but also because it is not used in human health programs. Enramycin (ENRADIN®) has bactericidal activity. It acts in the bacterial proliferation phase by hindering synthesis of the cell wall (formation of peptidoglycan chains). (ENRADIN®) works by inhibiting a step in the formation of a bacterial cell wall, and there is no known transferable resistance mechanism for this mode of action. VemoZyme® F 10000NTP is an intrinsically thermo-stable phytase enzymes preparation with activity of min 10000 phytase units per gram. One phytase unit corresponds to the quantity enzyme preparation, needed to release 1 micron moll inorganic phosphorus from sodium phytate per 1 minute at a temperature 37°C and pH 5.0. It increases the utilization of phosphorus and nutrients in the feed, and lowers the addition of inorganic phosphorus. VemoZyme® F improves production performance and feed conversion ratio. The use of phytase has very great biological, economic and ecological benefits. Use 50-75gm product per ton of feed during manufacturing of the feed. Store in dry and cool places, away from direct sunlight at a temperature less than 25°C. Virkon™ H2O can be applied to closed drinking water systems as a measured application to the reservoir/header tank, or via suitable dosing equipment attached directly to the incoming water supply, on a continuous basis over a prescribed number of days. Virkon™ H20 is suitable for preparation as an intermediate liquid concentrate stock solution, which can be readily deployed with suitable waterline dosing equipment. Prepare 1% (1:1000) dilution and offer birds in drinking water. All water systems can potentially contain some viral and bacterial contamination, especially header tanks where dust and debris can accumulate. Water quality, especially those sources which originate from a borehole, may be highly variable in respect to the microbiological status. Virkon™ H2O can be used for terminal disinfection of the drinking water system, between flocks, as part of the ongoing biosecurity cleaning and disinfection program. Excellent control of food poisoning pathogens to EU test standards. It protects against infection, during stress and antibiotic withdrawal periods. It inactivates antibiotics in the drinking waterline. It promotes good flock performance. It has proven activity at low temperatures. Virkon™ H2O is not classified as H413* and is not persistent in the environment, according to the standard European process for the classification and labeling of chemical preparations. Keep package upright in dry, cool place out of direct sunlight. Available in 4X5 liter and 20 liter drums. Virkon™ LSP is a powerful concentrated formulation providing flexibility and broad spectrum activity with efficacy against viruses, bacteria and fungi in a wide range of temperatures and in the presence of organic challenge. These qualities make Virkon™ LSP a flexible solution for general farm surface, equipment and foot-dip disinfection. Manually prepare a stock solution of 0.5% (1:200 dilutions) of Virkon™ LSP. Spray the solution onto all surfaces using a pressure pump at an application rate of 300ml/m2 for terminal disinfection. Manually prepare a stock solution of 0.5% (1:200 dilutions) of Virkon™ LSP. Spray the solution onto equipments using a pressure pump at an application rate of 300ml/m2 for terminal disinfection. Manually prepare a stock solution of 0.5% (1:200 dilutions) of Virkon™ LSP and use for foot-dip. Replace the dilution after 5 day if placed under sun shade and in the presence of sunlight replace daily. Wear suitable personal protective clothing including; waterproof coveralls (Tychem®), gloves and boots, and face protection. If ingested allow patient to drink water if conscious, but do not induce vomiting, seek medical advice. Virkon™ Sis meticulously controlled during the manufacture process to be a balanced, stabilized blend of peroxygen compounds, surfactant, organic acids and an inorganic buffer system. 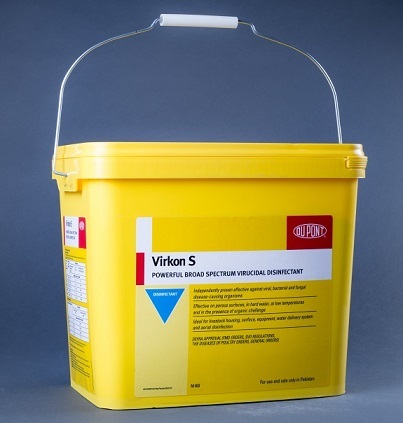 A unique patented formulation, effective against a broad spectrum of disease causing pathogens Highly versatile surface, equipment, water and aerial disinfection.Virkon™ S, the premier broad spectrum virucidal veterinary disinfectant, is recognized by industry and governments worldwide as a disinfectant of choice for livestock disease prevention and control. Virkon™ Spatented formulation is unique; no other disinfectant has the same powerful composition. In terms of efficacy Virkon™ S has been proven highly effective against 100 strains of virus in over 19 viral families, 400 strains of bacteria and over 100 strains of fungi. This list of proven efficacy includes the major OIE List of diseases like Avian Influenza (H5N1), Newcastle Disease, and Foot and Mouth Disease. Virkon™ S versatility provides the flexible solution for; surface, water and aerial disinfection, in hard water, on porous surfaces, at low temperatures and in the presence of organic challenge. Manually prepare a stock solution of 1% (1:100 dilutions) of Virkon™ S. Spray the solution onto all surfaces using a pressure pump at an application rate of 300ml/m2 for terminal disinfection. Manually prepare a stock solution of 1% (1:100 dilutions) of Virkon™ S. Spray the solution onto equipments using a pressure pump at an application rate of 300ml/m2. Manually prepare a stock solution of 1% (1:100 dilutions) of Virkon™ S and use for foot dip as gold standards for foot dip because it kills all microorganisms in 30 seconds. Replace the dilution after 5 day if placed under sun shade and in the presence of sunlight replace daily. All water system contain some bacterial contamination, especially header tanks where dust and debris can accumulate. Sanitizing will clean the system and eliminate existing bacterial or fungal growth. Manually prepare a stock solution of 0.1% (1:1000 dilutions) ofVirkon™ S and administered the bird for 8 hours daily (Once or twice in a week), 3-4days a week in case of outbreak. Clean the water for birds drinking and lowers the pH to support healthy intestine. Do not mix any vaccine or medication inVirkon™ S water. To control organisms that can be introduced into a livestock house or farm building during the setting up procedure, and to disinfect the air and other inaccessible areas of the building, use either a fine mist sprayer or thermal fogging machine to apply Virkon™ S disinfectant. Manually prepare a stock solution of 0.5% (1:200 dilutions) of Virkon™ S. Mist the solution via spray in presence of livestock using a low pressure pump at an application rate of 100ml/m2 for aerial disinfection. Manually prepare a stock solution of 10% (10:100 dilutions) of Virkon™ S and apply through thermal fogger at application rate of 17ml/m2. Virkon™ S is oxygen based disinfectant chemistry containing simple organic salts and organic acids. The active ingredient in Virkon™ S, decomposes by a variety of routes within the environment, in soil and water, breaking down to form the harmless substances, potassium salts and oxygen. Three-quarters of the ingredients of Virkon™ S are inorganic, which decompose in the physical environment to naturally occurring simple inorganic salts. The remaining, organic components are classified as readily biodegradable according to standard OECD and EU tests. Spectrum of activity and exceptional safety profile towards man and animals, when choice for: general surface, equipment, vehicle, foot dip, water delivery system and aerial misting. Store in a cool place out of direct sunlight, always replace lid after use. Available in 10kg bucket, 50kg drum and 2 x 5 kg buckets approved to UN standards. New improved Biosolve™Plus is a superior alkaline, multipurpose, heavy-duty cleaner and degreaser that are specifically designed to quickly remove stubborn build-ups of caked on faecal matter and heavy organic soiling, especially fats and greases. 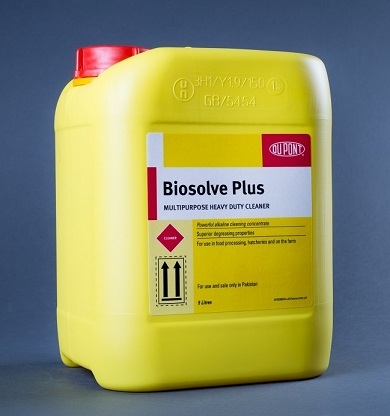 Suitable to be either foamed or sprayed on to surfaces and equipment, Biosolve™Plus is ideal for use in the hatchery, food processing environments and control house farming. Manually prepare a stock solution between 0.25-1% (1:400-1:100 dilution) of Biosolve™Plus. Spray the solution onto all surfaces using a pressure pump at an application rate of 500ml/m2. Using of hot water 60-65°C will improve the effectiveness of the product, particularly in high grease serrations. Allow a minimum contact time of 20 minutes then thoroughly rinse all surfaces with clean water at high pressure. Manually prepare a stock solution of between 0.5-2% (1:200-1:50 dilution) of Biosolve™ Plus.Apply Biosolve™ Plus foam to all surfaces at an application rate of 250ml/m2. Allow a minimum contact time of 20 minutes then thoroughly rinse all surfaces with clean water at high pressure. Biosolve™Plus is classified as CORROSIVE under EU Regulations. Wear suitable clothing including waterproof coveralls, gloves, boots and face protection. Store In cool place out of direct sunlight, do not allow freezing. If the product or its dilutions are smashed in the eyes, rinse immediately with plenty of water and seek medical advice. If ingest allow patient to drink water up till conscious, but do not induce vomiting, seek medical advice. Available in 20 and 4 x 5 liters drums approved to UN Standards. May be used in Setters with corridor pointing fogging machine up the central corridor, may be used in a coarse spray for surface spraying or a fine particle fogging (Thermal or Cold) for large areas such as rooms, poultry sheds. Do not spray directly onto eggs. The spray is not dangerous to the eggs but the oil base can possibly affect the eggs gas exchange by blocking pores if the eggs are regularly soaked. The use of the Clinafarm Spray in a fogger is extremely cost effective. 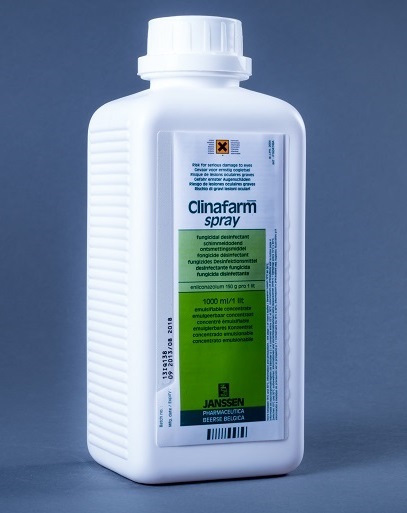 1 liter Clinafarm Spray should be mix in 99 liters of water. 1 liter of diluted solution is for 300m3 for fogging. Simplified Use in confined areas only Hatcher cabinets during hatching Fumigation cabinets Setters without corridors, Egg delivery trucks, Bulk feeders, Ventilation systems, rooms, and poultry sheds etc. Store In cool place out of direct sunlight, do not allow to freeze. Do not allow product to enter watercourses. Users should wash hands before eating, drinking, chewing gum, using tobacco, or using the toilet. Users should remove clothing/PPE immediately if pesticide gets inside. Then wash thoroughly and put on clean clothing. Users should remove PPE immediately after handling this product. Wash the outside of gloves before removing. As soon as possible, wash thoroughly and change into clean clothing. Hyperox™ is a colorless aqueous formulation of per acetic acid, hydrogen peroxide, acetic acid and surfactant, with a vinegar odor. Hyperox™ oxidizes sulphur bonds in proteins, enzymes and other metabolites. Hyperox™ disrupts the function of the cell membrane and causes rupturing of the cell wall. The potent protein denaturant action of Hyperox™ gives sporicidal activity. There is no evidence of bacterial diseases causing organism developing resistance towards Hyperox™as opposed to other disinfectant types such as Quaternary Ammonium compounds (QAC). Hyperox ™ is superior stabilized formulation provides greater application flexibility and broad spectrum activity with efficacy against virus, bacteria, fungi and spores at low temperatures and in the face of organic challenge. 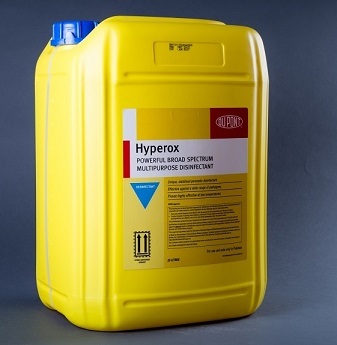 These unique qualities make Hyperox™ the per acetic acid disinfectant of choice for general surface, equipment, water delivery system and thermal fogging disinfection. Manually prepare a stock solution of 1% (1:100 dilutions) of Hyperox™. Spray the solution onto all surfaces using a pressure pump at an application rate of 500ml/m2 for terminal disinfection. Manually prepare a stock solution of 1% (1:100 dilutions) of Hyperox™. Spray the solution onto equipment using a pressure pump at an application rate of 500ml/m2. Manually prepare a stock solution of 10% (10:100 dilutions) of Hyperox™ and apply through thermal fogger at application rate of 17ml/m3. Always read and follow the product label instructions and information. Including the precautionary statements before use. Avoid contact with the eyes and skin during the handling. Avoid breathe during spray and use mask during spray. Wear suitable personal protective clothing including waterproof coveralls,gloves, boots and face protection. If the product or its dilutions are splashed in the eye, rinse immediately with plenty of water and seek immediate medical advice. Rinse any product off the Skin with plenty of water. If ingest allow patient drink water if conscious, but do not induce vomiting, seek immediate medical advice. Available in 20 and 4 x 5 liter drums approved to UN Standards. Avi Vit 33 Selenobooster isa unique formula of multi vitamins, amino acid along with selenium to boost the body functions and immunity with proven efficacy.The product, oral solution is indicated to fulfill the daily needs of vitamins, calcium, amino-acid and selenium levels for broilers and laying hens in intensive breeding farms. It improves the performances, daily weight gain and feed conversion.Improves the development of the young broiler chicks and stimulate the feather growth.Prevent stress after vaccinations, transport, and change of the feed. It also increases the eggs number, quality of the eggs, and thicker shell. 1-3 day of age. 1-2 days before and after any vaccination. 500ml product for 1,000 liters of drinking water, for 3-5 days, especially for the first week of life and when the stress produced by different agents, like bacteria and mycotoxins, change of the feed and during vaccination help to boost efficiency of the birds. Store it in a cool and dry place between 4- 25°C, in original container. Keep out of direct sunlight. Do not allow to freeze. Not for human consumption only for animal use. Ensure product is thoroughly mixed with water prior to use. The solution should be used within 24 hours. Consult your veterinary doctor before use. Hepatobooster is a complex formula based around those nutrients and nutraceutical that beneficiallyaffect liver function and health in mono-gastric. Include in clean drinking water at 1 liter per 1000 liter of water. At this stage of a birds life it is changing from being a fat metabolizer to a largely starch metabolizer. Chicks go from living on the yolk inside the egg and then absorbing the remaining contents of the yolk sac for the first days of life and changing to a largely cereal based diet relatively low in fat. This is a severe metabolic shock and normally results in low feed consumption for the first few days; however water is consumed at this time. 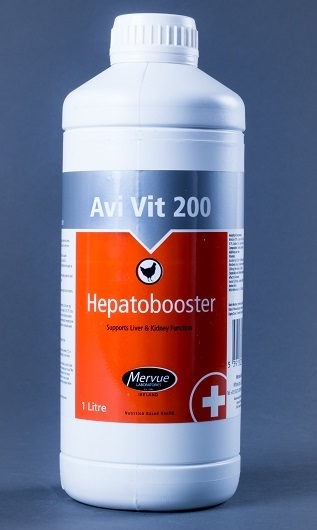 The use of Avi Vit 200 Hepatobooster for these days supports liver function and helps birds to start eating. All intake improvements help overall performance. Use for 3 days when changing feeds. It is normal to change broiler feeds at approximately at day 12-14 and day 24-26. In both cases it is from a lower fat to a higher fat diet – this again puts pressure on the bird’s metabolism and especially the liver. Disturbances to feed intake can occur at these times. As a flock of laying hens progresses through lay there is a tendency for birds to accumulate substantial deposits of fat in the liver. This may impede the activity of the liver in its function of metabolizing undesirable substances. As the flock ages, this can often lead to reduced productivity and an increase in mortality and drop of production. Layers and breeder hen intake target is 0.2ml per day. Where temperature is ambient the range of 20-26°C mix at a rate of 1 liter per 1,000 liters of clean drinking water and feed for 3-5 days. Where environmental temperatures are higher adjust mixing rate to allow forincreased water intake. This can maintain production. Typically Hepatobooster is given at weeks 50 and 55 of lay and again a week 60 depending on how long it is planned to keep the flock in production. GrowForte is water soluble blend of Vitamins, Electrolytes, Amino Acids, Organic Acids and Probiotic. Use 150gm GrowForte per 205 liters of drinking water. Continue for 5-6 consecutive days. Consult your veterinary doctorbefore use. Ensure that the product is thoroughly mixed with water prior to feeding. The drinking water should be used within 24 hours. TOXISORB® Classicefficiently binds mycotoxins and thus renders them innoxiously. In this fixed state it is impossible for the toxin to be resorbed from the animal’s intestine into the body and to perform its damaging effect. It simply leaves the body after the intestinal passage. The big difference in the chemical structure of the various toxins demands a tailor-made adsorbent for their effective binding mycotoxins have to be fixed selectively without preventing the absorption of nutritional compounds into the body. Raw material for the production of TOXISORB® Classic is a natural aluminosilicate named bentonite. The special adsorption capability for the various mycotoxins is achieved by a special modification of its mineral surface. Because of this surface modification, it is possible to decisively improve the selectivity of the adsorptive stability. It is a proven fact that TOXISORB® Classic does not have any negative effect on the animal’s supply of vitamins, amino acids, and trace elements. It can be used as feed additive or at farm level as well. To maintain the high performance of TOXISORB® Classic, it is necessary to store it in closed and low humidity areas. TOXISORB® Classic must not be stored next to chemicals that give strong odor or evaporate easily, since it can adsorb fumes to a high degree. It can be stored in silos and conveyed with compressed air (dry and oil free). Under these storage conditions, TOXISORB® Classic’s shelf life is typically 3 years after packing.